Forst Sixtus Simply delicious - simply solemn! 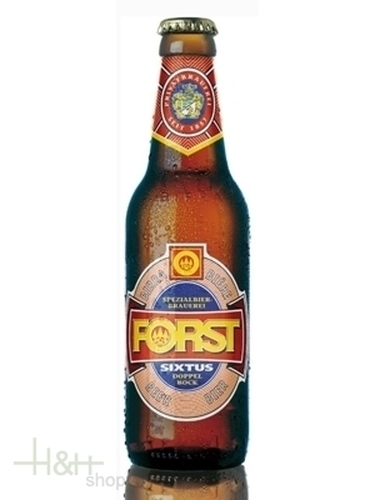 Forst Sixtus is a double malt beer, dark and amber-coloured, for special occasions. Its strong and malt taste reminds the old tradition of the brewers. Made with an old Forst recipe, this special double malt beer is ideal for those who love traditions. The brewer will show to the connoisseur three characteristic of this special beer: The colour - holding the beer up against the light, you can see brown and violet shades; The taste - thick, enriched with attractive flavour tea to cocoa; The surroundings - a "meditation" beer, which reminds the warmth of home and friends in an intimate and relaxing atmosphere. This is a classic example of non-stop tradition: the recipe of this inimitable beer has been unchanged for ages.